Today I’d like to touch on caring for your Crape Myrtle. Pruning a Crape Myrtle is quite fun and with the right info can be very rewarding. WHEN SHOULD I PRUNE MY CRAPE MYRTLE? The primary question I get on Crape Myrtles is, when to prune. The answer to this is simple, anytime. That being said, Crape Myrtles do bloom on new growth, with this in mind, if you are looking for maximum flower production and longevity on this years bloom, you will want to prune before spring growth. HOW DO I PRUNE MY CRAPE MYRTLE? As far as which cuts to make, I like to step back and assess the over-all shape of the tree, and look for opportunities to prune out limbs that detract from the look of the tree. On the interior of the canopy, look for any dead, crossing, or rubbing limbs to remove, as this will aid in the health of the tree, as dead wood, and tight intersections lend to invasive insects and pathogens. 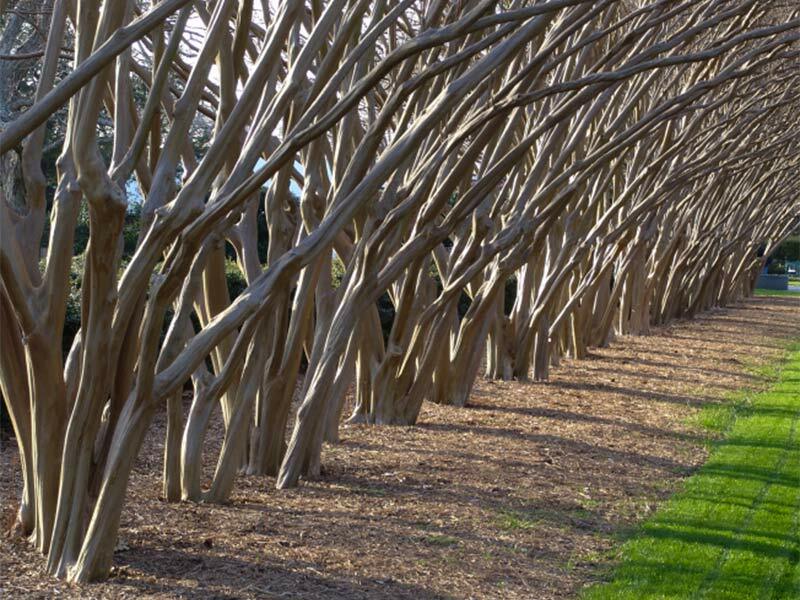 On older, more established Crape Myrtles that have not been regularly cared for, you may find some crossing and rubbing branches that are simply too large to remove, either due to their size or placement in the tree’s canopy. This is unfortunate, but a good motivator to address other smaller issues in the canopy while still small enough to do so without harming the tree. One more point on pruning Crape Myrtles, when healthy, this species tends to over produce interior growth, and as such will need to be periodically thinned ( about once per year ). My rule of thumb on thinning is, you should be able to easily view through the lower canopy, and the upper canopy should provide mottled shade to the ground below. If you have any further questions on caring for your Crape Myrtle, please feel free to contact me.